A puzzle piece named Oliver longs to be part of something magnificent. Each time he tries to fit in, it doesn’t go very well. The other pieces complain that he is the wrong color, shape or simply laugh at him. After repeated attempts to solve his dilemma, Oliver still cannot fit in. At his wit’s end, Oliver finally screams “If someone else is what they want, someone else is what they’ll get!” Oliver proceeds to hide himself in a disguise which allows him to not only fit in but also be accepted by other purple puzzle pieces. Although Oliver finally gets his wish, he soon learns that it doesn’t feel right. He concludes that “if I can’t be me, then what fun is it to fit in?” He boldly sheds his disguise but is sadly all alone again. Oliver soon realizes that once he is happy with himself, he will never be lonely. Author-illustrator Cale Atkinson’s tender yet humorous picture book about accepting yourself is a must read for all classrooms. Students of all ages will be captivated by Atkinson’s colorful and vibrant illustrations which depict Oliver’s struggles with finding his own identity. I cannot wait to share Oliver with students! With his father’s life quickly deteriorating, Marty is heartbroken that his jacket could be gone forever. But then he remembers his father’s story about The Train of Lost Things, an engine that gathered every true heart’s possession lost by a child. When he was younger, Marty believed that the story was true, but now wasn’t he too old to believe in magic? What if the Train of Lost Things did exist? Could he get his treasured jacket back which Marty believed was the key to healing his father? The Train of Lost Things will be released on March 20, 2018. 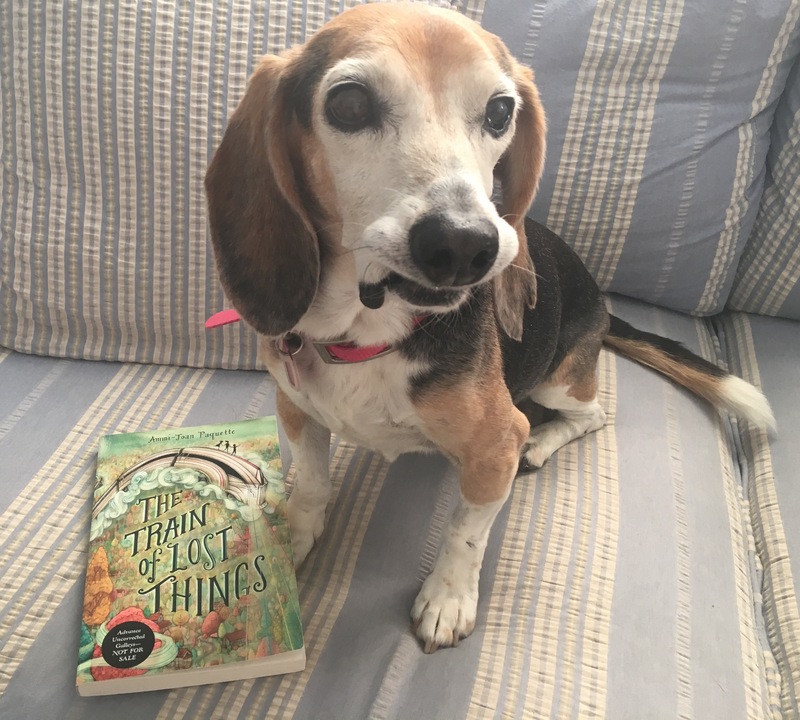 A special thanks to the author, Ammi-Joann Paquette for providing an advanced reader copy of The Train of Lost Things to our #bookexcursion group. Manny wears a different cape every day after school. His capes give him the courage to fight enemies such as sea creatures, zombie bears, and forest giants. He proudly chants that he is fearless, strong, brave, powerful, and invincible. At school, Manny wears his invisible, top-secret undercover cape which helps him conquer mutant monkeys, fiery comets, and giant squids but will it give him the strength to stand up to Tall One, who is bullying a fellow classmate? With the title Super Manny Stands Up, you can predict the ending. As I read the page when all the other animals joined Manny in confronting Tall One, I had chills. Not only does it teach students to stand up to bullies, but also that there is strength in numbers. With its heartwarming illustrations and powerful message, Super Manny Stands Up is a fabulous picture book for all ages. By day, Liam McKenzie is a 12 year old mild-mannered boy genius. He will deliberately misbehave though to cover his secret identity for at night he turns into the superhero, the Masked Avenger! He patrols his neighborhood with his loyal companion, Richie the Powerbeagle protecting the people of Franklin Street of such dangers as low tire pressure or repairing a faulty hinge on a gate. The Masked Avenger’s focus changes when he observes a beautiful woman who lives at the end of street. Although she appears fine, his powerful investigative skills state otherwise. The Masked Avenger must act! The Amber Amulet is reminiscent of mysteries of days past such as the Hardy Boys series. This 96 page novella is beautifully written and includes vintage illustrations which take the readers back to another time and place. Finally, the book’s message is simple yet profound. A little kindness towards others can change someone’s life. I hope there are more adventures for the Masked Avenger and his trusty sidekick! 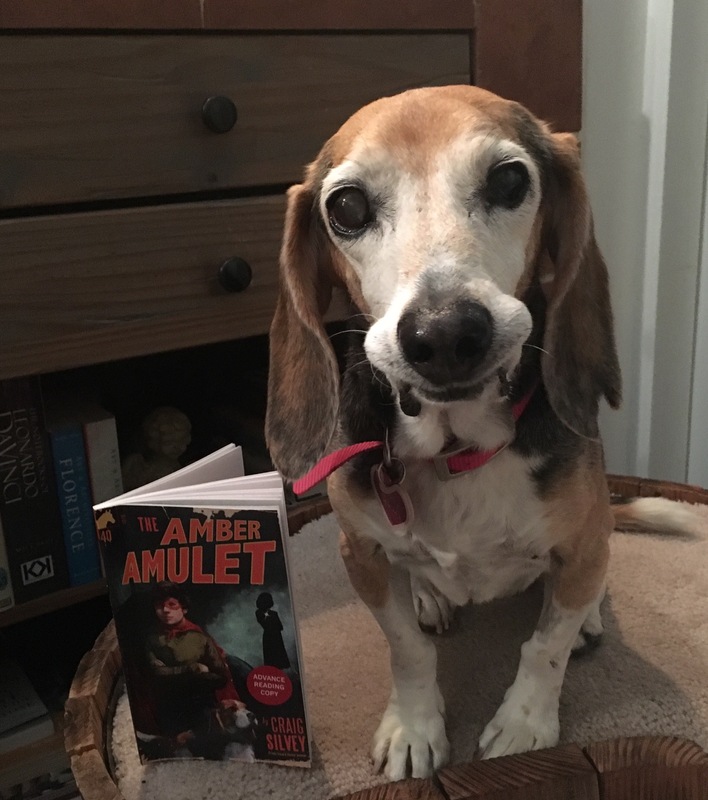 Special thanks to Alison Weiss and Ming Liu at Sky Pony Press for providing our #bookexcursion group with an advanced reader copy of The Amber Amulet. It will be released on November 10, 2017. Thunder Boy Jr. is named after his father, and he does not like his name. Although he loves his dad, Thunder Boy Jr. wants HIS own name that celebrates something cool that HE has done. 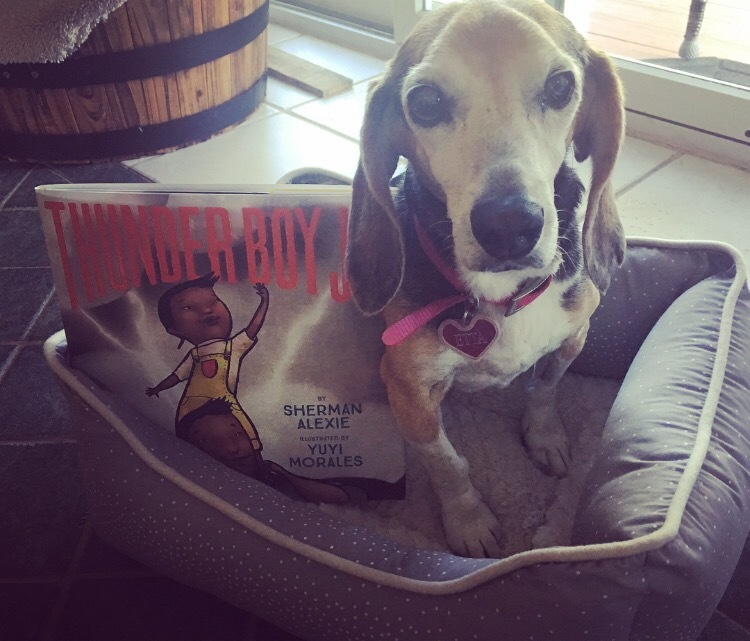 Throughout the story, Thunder Boy Jr. recounts many of his dreams and interests such playing in the dirt, going to garage sales, powwow dancing, and traveling the world to help him choose a new name. How about Mud in His Ears or Full of Wonder? At the end of the story, his father realizes that his son should have a name of his own. What is Thunder Boy Jr.s new name? Read to find out! Like How Oliver Fits, this beautiful story is about finding your own identity and being proud of who you are. The vibrant illustrations show Thunder Boy Jr.’s uniqueness and how special he is. Thanks so much for reading! Etta and I hope you have a wonderful week! Eagerly awaiting The Train of Lost Things. Love Super Manny! Just lent it out to a second grade teacher to read to her class. I am mailing The Train of Lost Things tomorrow! You will love it! 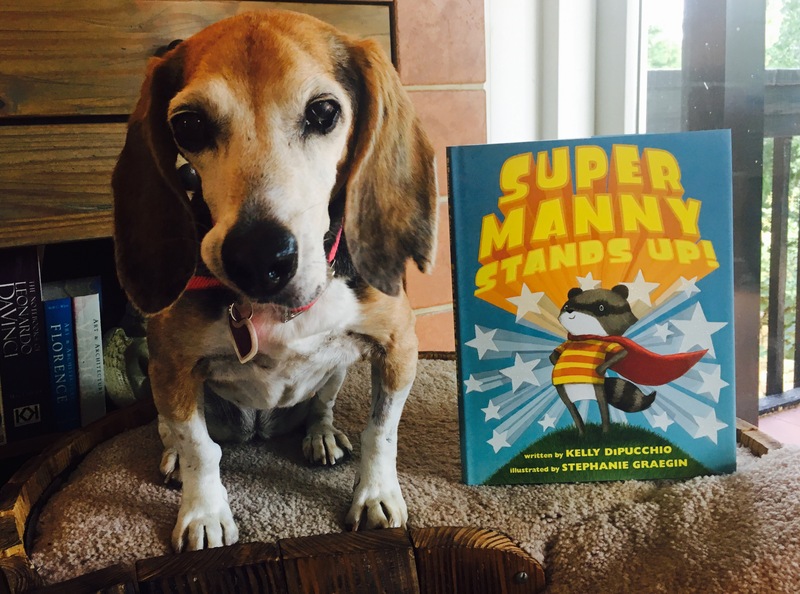 Super Manny stands up is a very cute book to share with young readers! I really love Manny and how the other animals support him. It’s such a great book for any age! I absolutely adored Thunder Boy Jr. Seeing your adorable beagle next to it makes it even better! Thanks for reminding me how much I loved this title! Aww! Etta thanks you! Love the book and its message! I’m a fan of Cale Atkinson anyway, but this is the second review raving about How Oliver Fits. I must find a copy. It is a must read! I will be sharing with students for #classroombookaday this week!